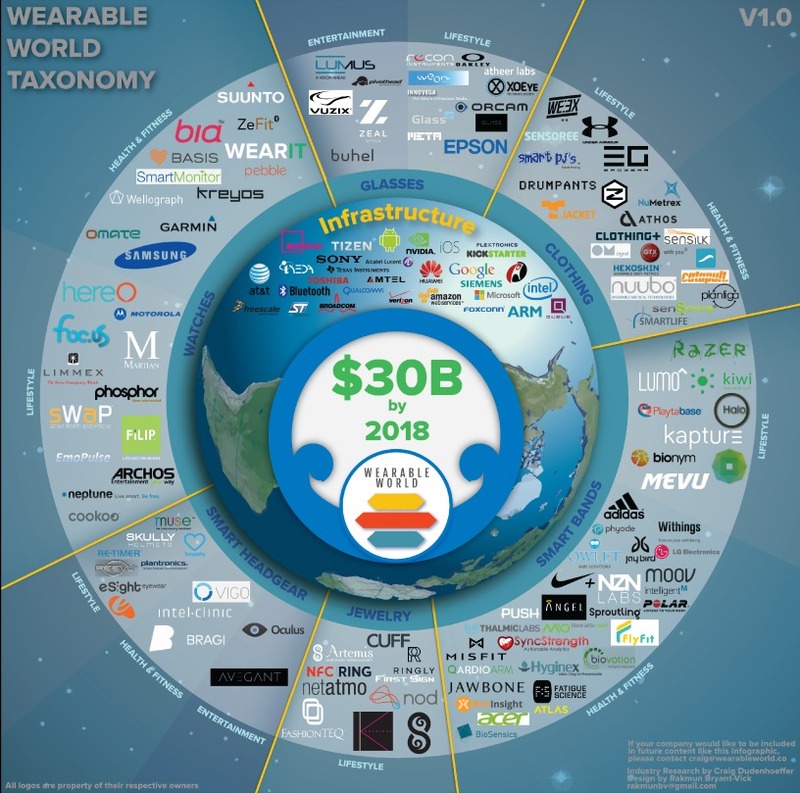 Wearable World, a San Francisco-based news and wearable information website, has released this great infographic detailing the current landscape of Wearable tech in the world. The most important message may be that the industry as a whole is projected to be worth $30 billion by 2018. “Increasing demand for fast, powerful, efficient and affordable mobile devices has driven the creation of highly portable hardware and the robust infrastructure needed to support a flourishing ecosystem of wearable devices,” wrote the blog. And now that giants like Google and Samsung have launched their own wearable products, even former skeptics are taking note. “The industry may still be in its early stages, but the number of companies developing wearables is fast expanding. With this growth comes an increase in overall product diversity,” wrote Wearable World. The blog created a huge list of wearables companies (including several Canadian), divided them into subcategories, like lifestyle, entertainment, health and fitness. As well, all the brands are distiinguished by the place on the body where the product is worn, such as headgear, jewelry, wristbands, clothing, glasses and watches.